Champignon -- also known as white button -- mushrooms have a mild taste that easily blends with other flavors. 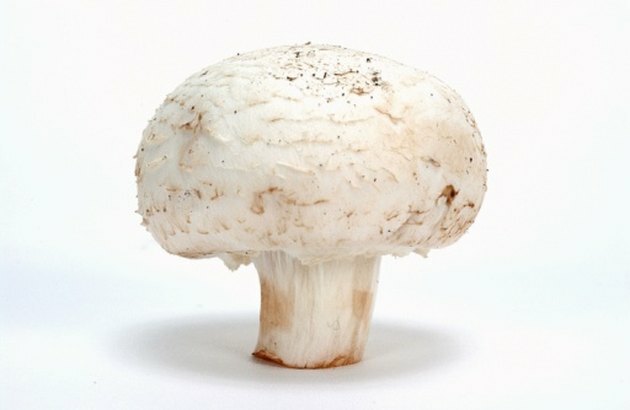 According to the United States Department of Agriculture, both raw and cooked white button mushrooms contain a significant measure of minerals and trace elements. Champignons are a favorite addition in salads, casseroles, meats, gravies, sauces and stews. To maintain freshness, wrap mushrooms in a damp paper towel and store them in a brown paper sack until use. Wipe each mushroom with a damp cloth or moistened paper towel to remove dirt and debris from the top and inside of the cap. Place the mushrooms on a clean cutting board, and cut a thin slice from the bottom of each stem and discard. Slice the champignons into approximately 1/4-inch slices with a sharp chef's knife. Preheat 1 tbsp. each of extra virgin olive oil and butter in a saute pan. Add mushrooms and cook until just tender; remove from the heat. Season to taste with salt, pepper and garlic if desired. Avoid soaking mushrooms in a water bath to prevent them from absorbing excess water. To preserve the moisture content of the mushrooms, do not add salt until the end of the cooking cycle. For a simple but hearty appetizer, stuff cleaned mushroom caps with a mixture of chopped stems, breadcrumbs and olive oil and bake in an oven at 400 degrees Fahrenheit for 15 minutes, or until golden brown. You can reconstitute dried mushrooms in plain water and use them in the same manner as you would fresh mushrooms.